Global Action International - dba Children's Christian Lifeline, hunger and medical relief has partnered with Mercy & Grace Charitable Trust to feed and care for destitute, orphaned and abandoned children in the state of Andhra Pradesh, India. These children are brought under one roof and are provided . . . 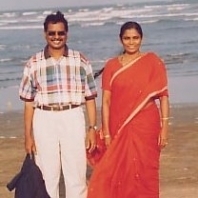 This ministry started with four children living at the apartment of Madhava & Nirmala. He quit his bank job and used his salary and savings to build a beautiful building which now houses 120 orphans. Thank you for your help in caring for these children. Training is given to help women become self-sustaining individuals by helping them earn a livelihood and carry on their lives with honor and dignity. This is being done as sewing machines have been donated and women have started their own sewing centers. They are also training to maintain their own records, savings program and operate their own bank account.